Kevin McLaughlin did a lengthy story over on CRN.com in May about how Unified Communications is the “next big thing”, and while his reasoning is sound, including his observation that Cisco is leading the pack, I would argue that we’ve passed the tipping point with this technology. There are a couple reasons I would make this assertion, including the maturity of the software, the availability of support and resources from the vendors, and the increasing number of “pre-validated” or “appliance” builds out there and available for customer use. 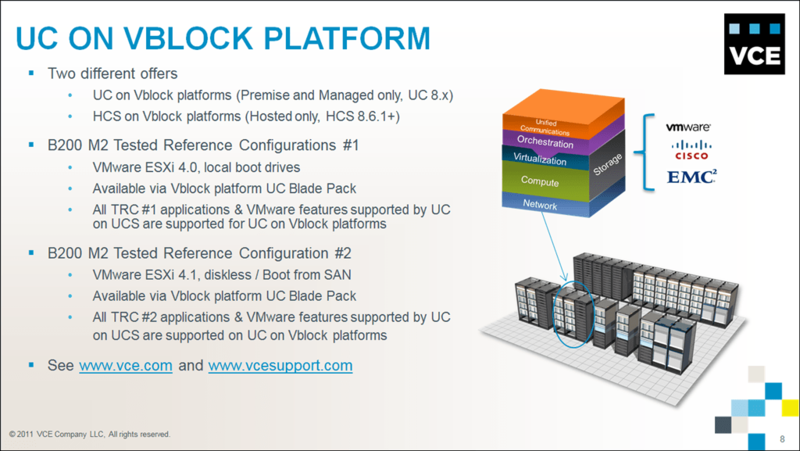 As one of the VCE parent companies, we have a vested interested in not just selling more UCS and Nexus gear (although that’s great too!) but also in providing the best, most supported, most stable environment for all of their fantastic software platforms. Cisco Unified Communication and the Cisco Hosted Collaboration Suite are two of the more popular, and as part of the VCE solutions development effort I’m pleased to give you a preview of a couple announcements we’ll be making at Cisco Live 2011 next week! The Cisco Hosted Collaboration Solution provides many of the same features, but does so in the context of services providers looking to leverage a multi-tenant framework. With an incredible management, automation and orchestration package, HCS is a fully integrated toolset for service providers to offer the power of Cisco UC to customers in a services-based model. 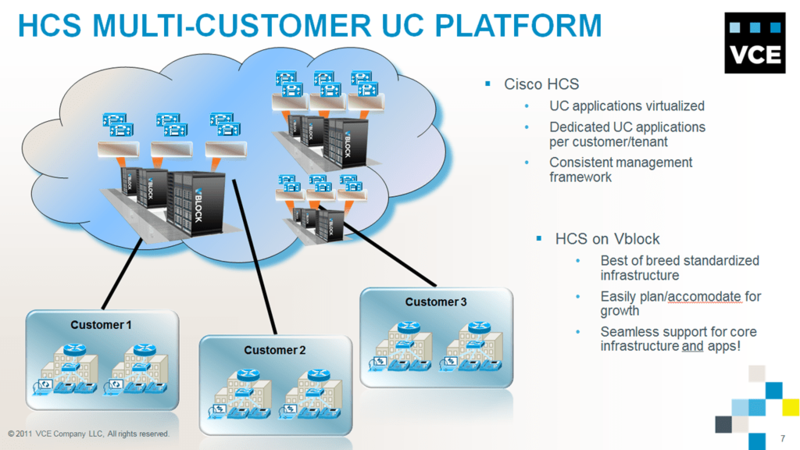 For end-users, HCS is a way to get access to all of the Cisco UC goodness on an OpEx basis, while potentially lowering the CapEx outlay that would be otherwise possible. The ability to choose a provider and choose the services and options that are required, Cisco HCS can be a powerful offering for both end-user and service provider. In partnership with Cisco, VCE is pleased to present the latest in our pre-tested, pre-validated solutions, Both Cisco Unified Communications on Vblock and Cisco Hosted Collaboration Solution on Vblock will be made publically available at Cisco Live 2011, and I’ll be in the VCE booth and theater to talk to customers and SP partners about how these solutions can help them. What makes these solutions unique? Fully integrated support between VCE and the world-class Cisco Voice TAC to provide seamless support for infrastructure and software! As with all VCE solutions, there are a lot of things that have happened in the background to make these public. Multiple lab teams, great project management, lots of engineers talking to customers, the marketing and tech writing teams and the fantastic UC and HCS product teams inside the Cisco Voice Technology Group have all worked overtime to sync these solutions with the Cisco product roadmaps, and everyone deserves a huge amount of credit. There are too many people to name without missing someone important, so I won’t try, but it’s been a great team to work with. I’ll also be participating in a video-based bloggers panel on Tuesday afternoon at 4:30pm so I’m sure I can work something about UC/HCS in there as well! I’m very excited about the show and hope you get to join us!